Submersible Aquatic 2 data loggers record temperature as part of an experimental project into antibiotic resistance in farmed fish. Water temperature is monitored by the Tinytags in the fish farms for use in antibiotics resistance analysis. Matthieu GAUMÉ is an engineer at ITAVI, a French Technical Institute established for over 50 years and recognised by the government in supporting the development of the domestic fish farming, aviculture and cuniculture sectors. Matthieu specialises in fish farming, and has been researching water temperature as part of an experimental Project looking into antibiotic resistance. 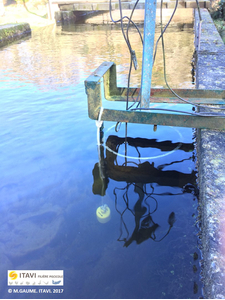 Two Aquatic 2 Tinytag data loggers have collected data to help characterise the environmental parameters in the area surrounding the Project's regular water collection sites. Water collection took place every 15 days for 18 months, and the loggers recorded the temperature every 5 minutes. They were deployed in the entering water flow canal of the two volunteer fish farms participating in the study. Using the Tinytags was a key part of the study because bacterial development in water is directly correlated with water temperature. Also, the speed of development of bacteria colonies and the profile of bacteria strains are directly driven by water temperature (in addition to other parameters like pH, BDO5 (Biological Oxygen demand on five days) nutriment concentrations etc. …). Recorded data will be used to try to find correlation between the water temperature and the profile of the antibiotics resistances analysis results in order to be able to better anticipate antibiotic resistance. Matthieu and the Project Team chose Aquatic 2 Tinytags as they were ideally suited to the application. A very robust logger with a very long life battery (more than 18 months with a 5 min recording frequency) was required, and additionally, the inductive pad used to offload the data from the loggers proved to be an extremely quick and simple method under all weather conditions! Matthieu comments, "The Tinytag Aquatic 2 is the perfect temperature logger for our field R&D experiments. They record temperature with high precision (the pdf file above shows an example of a downloaded Tinytag Explorer file) and they have proved consistently reliable throughout the entire period of recording!"